Beeswax Candle Sticks (Pair) approximate 6" high. 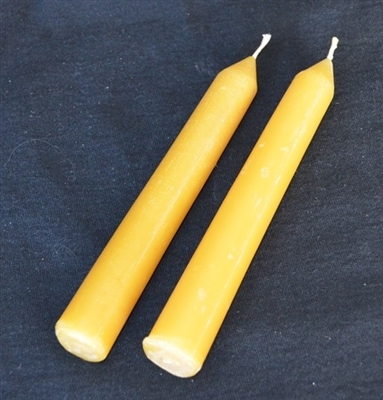 Our beeswax candles are homemade from scratch. We melt down our fresh yellow cappings (cappings are removed from the honeycomb as part of the extraction process) and pour into candle molds. They are not made from bleached wax and have that natural beeswax smell to them. Try a set you won't be disappointed!! Some of our candles are also available with essential oil scent. Keep in mind that essential oils will create a mild scent when burning the candle. The essential oil will not create an overwhelming scent that carries throughout a home. Due to the chemicals involved in artificial scents we choose not to offer stronger chemical fragrances. NEVER LEAVE A BURNING CANDLE UNATTENDED. We always recommend placing candles on a proper dish in the event wax would drop off the candle.